There are different names for this park which could be confusing. Natal Drakensberg Park is the name used to refer to the Ramsar wetland. Geographically, the Ramsar wetland is the same area as the uKhahlamba Drakensberg National Park of South Africa. Combined with the Sehlathebe National Park of Lesotho, the area is referred to as the transboundary Maloti-Drakensberg Park World Heritage Site. The site has exceptional natural beauty in its soaring basaltic buttresses, incisive dramatic cutbacks, and golden sandstone ramparts as well as visually spectacular sculptured arches, caves, cliffs, pillars, streams, rivers and rock pools. The site's diversity of habitats protects a high level of endemic and globally important plants, and harbors endangered species such as the Cape Vulture and the Bearded Vulture. This spectacular natural site contains many caves and rock-shelters with the largest and most concentrated group of paintings in Africa south of the Sahara. An estimated 600 rock art sites with probably more than 35,000 individual images that depict animals and human beings. They represent the spiritual life of the San people, who lived in this area over a period of 4,000 years. The Park is a national and international asset due to its unique natural and cultural values, and as such it has been listed as a World Heritage Site of dual significance, one of only 23 properties worldwide at the time of listing to be listed as such. This report focuses only on the South African side of this World Heritage Park, the uKhahlamba Drakensberg National Park, or similarly the Ramsar wetland, Natal Drakensberg Park. It is a huge park, covering 242,813ha over a distance of nearly 200km along most of KwaZulu-Natal's south-western border with Lesotho. It is by far the largest Ramsar wetland in South Africa – nearly double the size of the St Lucia System which is the second largest. The park’s border follows the watershed above the Drakensberg escarpment, which consists of a continuous, abrupt and rugged scarp or mountain wall. Lesotho's Thaba Ntlenyana at an altitude of 3,484m, the highest peak in Africa south of Kilimanjaro, lies along this scarp. Other outstanding topographical features in this formidable barrier of cliffs and peaks includes the Amphitheatre, a semi-circle of high cliffs with a sheer drop of 613m; Mont-aux-Sources at 3,282m, Cathedral Peak at 3,004m, Cathkin Peak, Champagne Castle, Giant's Castle at 3,314m, and Sani Pass in the south. The Drakensberg range of mountains constitutes the principal water production area in southern Africa and is thus critical to supporting both the people and the economy of the sub-continent. The mountains are deeply incised by the tributaries of the three largest rivers in KwaZulu-Natal, the Tugela, Mkhomazi and Mzimkulu. These river catchments hold many sheer cliffs, with near-vertical walls more than 500m high. 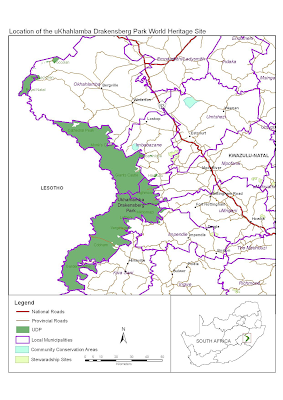 It is also the east/west watershed divide between the Orange/Senqu River system flowing west into the Atlantic Ocean and the uThukela, uMkhomazi and uMzimkhulu River systems flowing east into the Indian Ocean. At lower altitudes, these steep basalt cliffs give way to slopes that form a large grassy terrace of variable width, interspersed with bands of exposed basalt. Lower still, the grassy terrace falls away as cave sandstone cliffs are dissected by rivers and streams to form valleys, gorges and inselbergs. Temperatures are extreme and can range from -15 °C to maximums of 35 °C, depending on altitude. Annual average rainfall is 800mm, falling mostly in summer. The Drakensberg is regarded as the most important mountain catchment in South Africa due to its high yield and water quality, supplying rural, agricultural, urban and industrial users downstream. The rivers that originate in these mountains support extensive, interconnected wetlands of various types ranging from open waterbodies such as mountain tarns to vleis, marshes and an intricate network of streams and river courses. Conserved since the turn of the century, the entire wetland system is in near-pristine state. The Drakensberg escarpment is one of the primary breeding strongholds of the Cape Vulture and Bearded Vulture, and the park is an important refuge for these species. This is the only population of Bearded Vulture in the southern hemisphere. The area also provides a vital refuge for more than 250 endemic and endangered plant species and their associated fauna. From all of the above it is clear why the complete park was regarded of international importance and received Ramsar status on 21 Jan 1997. It is not an over statement to say that this park has natural splendor unequaled in southern Africa. With so many remote mountains, water streams, pools and just beautiful nature, the Natal Drakensberg Park is a hiking haven. There are multiple trails ranging from short excursions to week longs hikes. Other activities that make the park very popular for tourists are mountain biking, paragliding, trout fishing and bird watching. Threats and issues that challenge the park management include illegal access from across the Lesotho border, poaching of wildlife, pending land claims, combating alien plants and fish species, agricultural activities such as illegal grazing and poisoning, and water pollution from neighboring communities. The park is divided into several smaller reserves each with its own park management. This includes Royal Natal, Cathedral Peak, Monk’s Cowl, Giant’s Castle, Injisuthi, Highmoor, Kamberg, Mkhomazi, Lotheni, Vergelegen, Cobham, Garden Castle. The park and all these reserves are owned and managed by Ezemvelo KZN Wildlife. To provide readers with an overview of what to expect, we visited four of the lesser known reserves, all towards the southern region of the park. Kamberg is an agricultural region with many commercial dairy farmers in the KwaZulu-Natal midlands. Kamberg is an Afrikaans name given to a specific mountain that reflects the image of a rooster’s head. Kamberg Nature Reserve is situated centrally in the foothills of the Drakensberg mountains. The reserve was proclaimed in 1951 and is 6,300ha in extent. This reserve is particularly scenic, with a number of walks throughout the area. There are many rock shelters containing San rock paintings that are outstanding in quality and diversity representing the spiritual life of the San people who no longer live in the region. The San Rock Art Interpretation Centre next to the reception office runs DVD presentations on rock art. Trained guides are available to take visitors to Game Pass Shelter to see rock art paintings, a 3 hours walk. The Kamberg reserve is divided into 2 sections. The main section hosts accommodation facilities in the form of 5 self-catering 2-bedded chalets equipped with an internal fireplace. The chalets are serviced daily. In addition, there is a communal lounge with a large freezer and DSTV. There is a picnic site for day visitors but no overnight campground. A small curio shop at the reception office supplies basic foods and some camping essentials. The Mooi River which originate not far from here, runs through this section of the reserve and adds to the natural splendor. Unlimited trout fishing is allowed in the Mooi River to assist with the elimination of this alien species. There are also 2 dams artificially stocked with trout for enthusiastic anglers all year round. The other section of the reserve, called Stillerust, is a typical grassland wetland. Here you will find herds of Black Wildebeest roaming the flat grasslands on the slopes of the mountains. There is also a vulture restaurant catering for the Cape Vultures. An old farmhouse with gas lights, fridge, a stove and linen offers self-catering accommodation for up to 10 people. Roads leading to Kamberg are accessible by any sedan vehicle, although the last sections of the tarred road are littered with potholes. We took a day-drive from Kamberg to Highmoor. What a nice surprise. The road leading to Highmoor starts as a gravel road in good condition passing several commercial farms, guest farms and holiday retreat venues. The last section of about 5km is a single track with tarred surface to conquer the extreme steep uphill. Highmoor, 14,749 ha in extent at an altitude of more than 2,000m above sea level, is also situated in the central region of the Natal Drakensberg Park. It offers the visitor a variety of experiences but is renowned for its excellent trout dams and scenic views. There are no accommodation options in the form of chalets or bungalows, but there is a very nice campground with endless views from the heights over the valleys below. The 8 camp sites are big and spaced well with thorn bushes in between to make each site really private. Each site has its own braai grid and water taps are available close by. A small ablution facility offers toilets and warm showers provided by gas geysers. No electricity is available. A picnic area for day visitors is situated just outside the car park next to the reception office. Hiking is also the main activity at Highmoor. Several trails are available and all start from the reception office. The friendly staff will gladly assist with guidelines, maps and directions. In our case, the enthusiastic Pinky Dlamini offered to accompany us during her lunch break to the wetlands on the upper slopes of the mountains. It took us about an hour to reach the top, crossing several streams with small wooden bridges while rain and thunder were threatening in the distance. All the effort was well worth it to see the unspoiled pans in the upper grasslands and valleys. The reserve offers two caves where hikers can overnight. Caracal Cave accommodates 12 people and is a 3,5 km tough walk from the camp office. Aasvoëlkrans Cave also accommodates 12 people and is approximately 4 km from the camp office. This is an easy hike and is ideal for novices and family groups. Although there were not many birds to be seen during our short visit, we saw Eland, Blesbok and Mountain Reedbuck. Two well stocked trout dams are available for fishing. Highmoor is superbly managed and appeared clean, well organised with all facilities in a good working order. To get to Lotheni one travels on gravel roads through several local communities before reaching the entrance gate, roughly 45km north of Himeville. From here a tar road leads you all along the Lotheni river and its swimming rock pools at the foot of high mountains to reception 4km further on. We stayed in one of the 12 bungalows close to reception that offer either 2- or 3-beds situated on a ridge overlooking the Lotheni river valley. There is a refrigerator, small gas stove, and bathroom. Inside the sleeping room is a cozy fireplace which will be very useful in wintertime. It is a pity that there is no verandah with a nice thatched roof overlooking the valley. This will make a barbeque in rainy weather extraordinary. There is a communal entertainment area with barbeque facilities not far from the chalet, but unfortunately with no view over the beautiful surroundings. A generator provides electricity between 17:00 and 22:00. Outside these hours the geysers and fridge are operated by gas. A gravel road across several streams takes you to the campground a further 2km into the reserve. This is where the road ends – there is no exit other than at the main entrance gate. Due to the poor road conditions, particularly in the rainy season, high clearance vehicles are recommended. The campground offers 14 large sites with good views over the surrounding mountains. Each site is identified with an animal name such as Eland, Otter, Jackal. There is no electricity, but hot water showers are provided by gas geysers. Lotheni Nature Reserve, 3,984 ha in extent, is noted for its magnificent scenery and hiking. Several hiking trails are possible, mostly single day circular trails ranging between 2km and 15km. Two caves where 4 or 6 people can overnight are also available. The Jacobs Ladder Trail of 2km is a popular walk for all. It starts from the reception office and crosses the Lotheni River with the Tebetebe suspension bridge. The reserve is a popular rendezvous for trout fishermen. Several kilometres of the Lotheni River is available for fishing brown trout. Simes cottage is situated next to a small trout dam reserved exclusively for anglers. The converted old farm house can accommodate 10 people in four bedrooms. Although we did not witness all of it, wildlife includes species such as common and Mountain Reedbuck, Grey Rhebuck, Eland, Grey Duiker, Oribi, Cape Clawless Otter, Mongoose and Baboon. There is a diversity of birds, including Black Stork, Verreaux’s Eagle, Bearded Vulture, Lanner Falcon, Cape Vulture and Giant Kingfisher. Mountain biking is allowed in designated areas. Although chilly, swimming in the Lotheni River is safe unless it is in flood. There is a very good swimming spot approximately 1 km below the reception office at Cool Pools. Just before the reception building is the Lotheni Settler’s Homestead Museum. An interesting collection of early settler farming implements and home utensils are on display at the old Root homestead, which has been restored and refurnished in the style of the earlier period. Cobham is a large reserve in the south of the Natal Drakensberg Park. It is not far from Sani Pass in the vicinity of Underberg and Himeville, approximately 150km from Pietermaritzburg. The reserve is managed together with Vergelegen Nature Reserve and together is approximately 52,000 ha in extent. The reserve’s entrance, reception, buildings and grounds are impressive and well kept. It is clear that the park is well managed by Charl Brummer, the current Officer In Charge. A large campground with no designated sites is available for overnight visitors. The nearby ablution facility offers 8 toilets and 4 hot water showers. The only other accommodation available is a back-packers style old house with 30 bunk beds, reserved for hikers. Hiking is very popular at Cobham, especially the 60km Giant’s Cup Hiking Trail from Sani’s Pass to Bushman’s Neck. This is a 5 day hike where hikers will overnight in remote huts spread along the route in the mountains. There are 9 different caves situated throughout the reserve that can accommodate between 2 and 12 overnight hikers. These caves are between 10 and 18km from the office and can be reached within 3 to 8 hours. Fishing in the Pholela River is permitted. Cobham has a small curio shop which sells curios and refreshments.